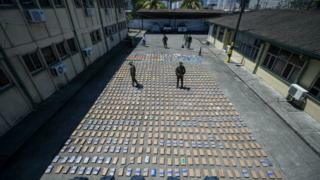 One of Colombia's most powerful drug gangs, the Gulf Clan, has said it wishes to submit itself to justice. President Juan Manuel Santos said that he had authorised justice officials to look at the request. Mr Santos said more than 1,500 members of the gang had been arrested in the last few months and its second-in-command had been killed. The gang's leader, known as Otoniel, has told the president he would hand himself in. Mr Santos said he had warned the group that its members would not get special treatment. "I have told them they are criminals who, if they hand themselves over, the law will give them some privileges depending on what they deliver and the value to society of what they deliver," he said. A hat trick for the government? After more than two years of intense operations against the Gulf Clan, President Santos said its leader had contacted the government to find a way of handing himself in along with the rest of his group. If their submission to justice materialises, it will be the third landmark in the past few weeks for peace in Colombia, after the disarmament of the Farc guerrillas and the recent commitment of the ELN Marxist rebels to a 102-day long truce. The news is great publicity for President Santos, coming just as Pope Francis is due to begin his visit to the country. The gang is known mainly for drug trafficking but has also been accused of extortion, illegal mining, forced disappearances and murder. The Gulf Clan - formerly known as the Úsuga Clan or Urabeños - has its power base in the Uraba region, but its network extends across the country and beyond. Announcing its surrender, the Gulf Clan published two videos - one addressed to President Santos and one to the Pope, who begins a visit to Colombia on Wednesday. In the video to Pope Francis, Otoniel said he was "just another Colombian who longs for peace" and asked for the pontiff's prayers for stability in the country.